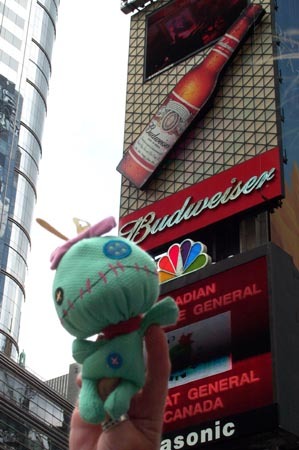 We first met Scrump on 42nd Street & Broadway on the Island of Manhattan. She was able to procure for us sixth row seats to see the "Lion King". It pays to have well-connected friends! 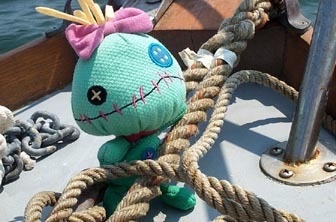 Scrump was a starlet in her own right. 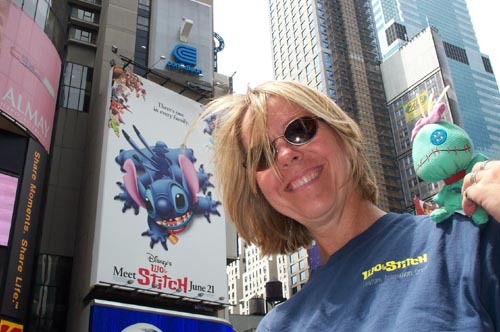 We didn't know what movie she starred in, so she took us to Times Square & showed us a poster of the feature that she made her cinematic debut. We had never heard of it. I suppose it is a movie about sewing. 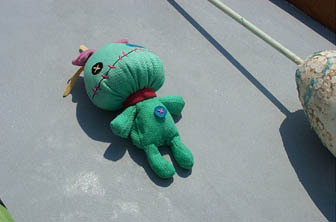 Scrump-ey really KNEW how to PAAAAARTY!!!. She knew Gotham like nobody's business. She knew all the "Hot Spots" The only thing she didn't know was, "What's this thumb doing 'twixt me legs?!". 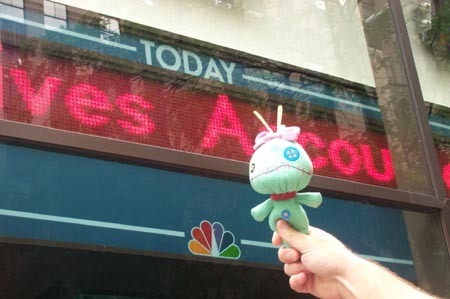 We spent time with Scrumptious at NBC. Boy, talk about "Must See TV"! 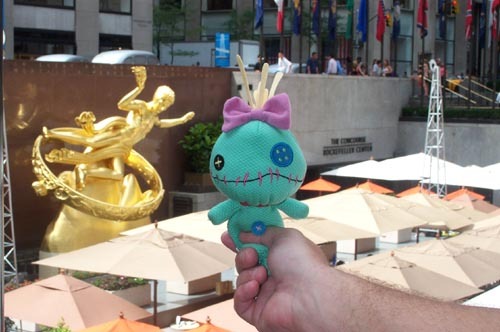 We hung around here for hours as the brazen strumpet flaunted herself at anyone that seemed to look like Al Roker. It made me sick. When we arrived, we found the skating surface covered with umbrellas. It turns out that the ice skating rink is converted to a bistro during the summer months. Disappointed!!! Scrump knew the streets. Everywhere we went, people knew her. 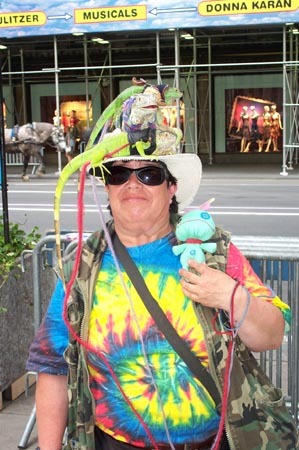 This is her old buddy, the Iguana Lady. So named because of the three iguanas ever-perched upon her head. What better way to escape the stifling heat of the city than going to your home on the ocean. 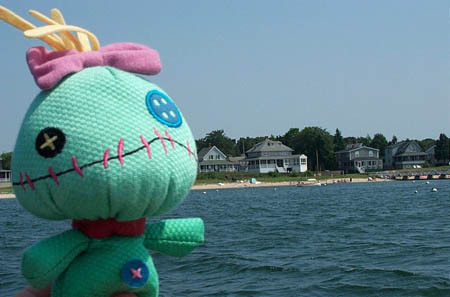 Scrumpilla's contract allowed her to buy a residence on Cape Cod. "The sun feels different when you're laying around. 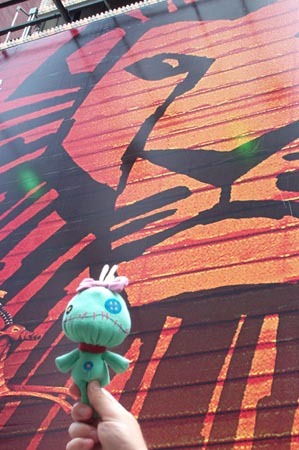 ", Scrump says. 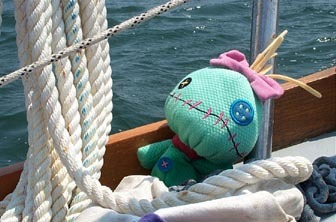 What was tough to endure in the city is pure heaven when relaxing on the sailboat of one of her friends. "When ya git too hot, just jump over board and cool off!" 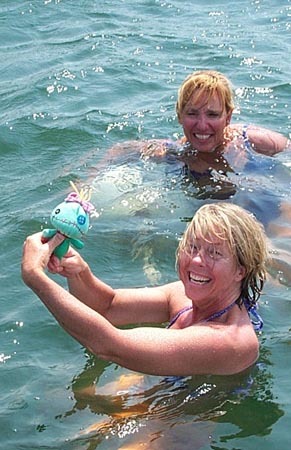 Scrump & Cump(Sandra & Dianne) frolicking in the cool waters of Buzzard's Bay. 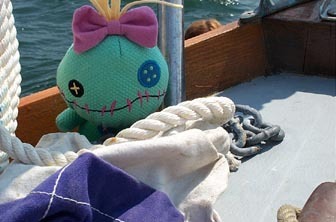 Scrump-oneous was quite the nautical savant. Here she demonstrates the proper technique for tying a sailboat to a mooring buoy. Back to the Home Page Please!